Want to keep in the loop on the latest happenings at Chabad NDG Jewish Community Centre. Subscribe to our mailing list below. We'll send you information that is fresh, relevant, and important to you and our local community. Chabad of NDG buys a church Rabbi, Imam and Priest on the Tommy Schnurmacher Show 9 Craziest Sukkahs In the World Relationships, Identity, Intermarriage on Yom Kippur Agenda Young Professionals New York Shabbaton Leaving the fold in search of a besser life Artistic Transformation in Trendy Montreal Village Chabad of NDG hosts Pre-Screening of a Documentary about Lubavitch Women Upsherin Once - A Review Why Buy Flowers? TICKETS ON SALE NOW! BUY TICKETS NOW! 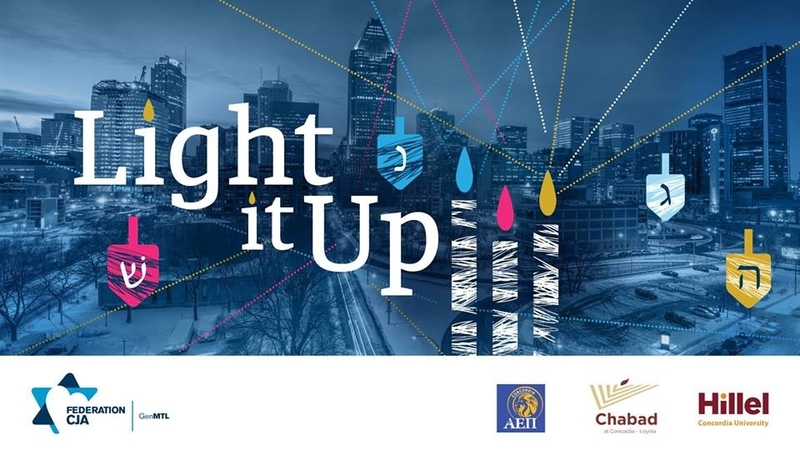 Hillel Concordia, Chabad Concordia - Loyola and AEPI invite you to Light It Up! Don’t miss the most anticipated Hanukkah party of the semester. We’ll have a photo booth, delicious food, a fully-stacked bar, jelly donuts and MORE! Join hundreds of students and young adults and let loose, while celebrating the festival of lights! Raffle tickets will be sold, and we’ve got some amazing prizes! Avec des centaines d’étudiants, viens faire la fête et t’amuser comme un fou avant le début des examens pour célébrer le festival des lumières. Billets de tirage en vente. Tu pourrais gagner des prix fabuleux!